Description: It's on to Berwyn where I quickly caught this UP/LTEX combo moving east with stacks. 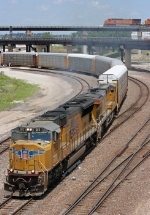 Description: A UP southbound rack train passes through Hennessey on its way to Oklahoma City. Description: UP 5113 speeds across the Cimarron River bridge just south of Dover. Description: Shot from inside Haley Tower. Description: Q389 rumbles westward with matching UP power. Description: UP AAMKB departs Armourdale Yard while a BNSF S train passes overhead in the background. Description: I am not really sure 3 locos were really necessary. The train has less than 30 cars! Description: Norfolk Southern Freight Train 154 makes their way Eastbound as they pass by NS Westbound Vehicle Train 26G in Tallapoosa, GA. Description: Manifest 174 heading north on the Marion Branch.